In March 2018, several of us sat in a rooftop garden overlooking downtown Oakland. As we discussed the future of the region, the city skyline suddenly appeared as a timeline, revealing the past and future imaginations of developers, city planners, and investors. We could literally see the concrete visions of developers from 100 years ago towering next to the visions of today’s developers unfolding before our very eyes. Taken together, these buildings represented much more than just a place to work or sleep, but an idea about how life should be lived and who the city is for. Undoubtedly, these people have a long-term vision for this city -- and their visions are backed by capital and political power. What was our 100-year vision for the Bay Area? Could we even begin to imagine such a thing? As importantly, whose vision should it really be? We -- Desi and Marissa from People of Color Sustainable Housing Network (POCSHN) and I -- had just come from a shared meal with the Sogorea Te Land Trust, the only urban Indigenous women-led land trust in the country, working to restore Chochenyo and Karkin Ohlone lands in the San Francisco Bay Area to Indigenous stewardship and create opportunities for all people living in Ohlone territory to collaboratively re-envision the Bay Area community. The Ohlone peoples have a 5,000+ year relationship with this land already. It began to seem clear that if we no longer wanted to live inside the visions of those remaking the city now, those of us in the housing justice community needed to start thinking on a longer timeline. Over the next year, folks from POCSHN and the Law Center shared meals with a number of other organizers struggling for land justice in the Bay Area, sharing our work and the challenges facing our communities. What emerged was a shared interest in developing a long-term collective vision for land justice in the Bay Area. Too often, we realized, our efforts for justice have remained siloed, limiting the scope and efficacy of our impact on the communities we are accountable to and the lands we are in relationship with. What if we organized a multi-day strategic convening to seed a collective 100-year vision for land justice in the Bay Area? Could we deepen relationships between housing justice groups working to prevent evictions, expand rent control, and develop long-term solutions to displacement; indigenous-led organizations working to protect sacred sites and reclaim traditional lands; and food and farm justice organizations working to localize food systems, support sustainable agriculture, and transform farmland access, stewardship, and ownership in the Greater Bay Area? In March 2019, 30 organizers convened on the territory of the Federated Indians of Graton Rancheria at the Occidental Arts & Ecology Center. Over three days, we built fellowship together, getting to know not just what our respective organizations are doing, but what brings each of us to this work and where we see ourselves going. We mapped the nearly 100 grassroots movement efforts we are collectively part of right now in the greater Bay Area, specifically efforts led by indigenous, black and POC communities and organizers -- from Indigenous-led land trusts to a fruit tree nursery staffed by people impacted by mass incarceration to housing justice policy coalitions and so much more. And, while recognizing we were not a complete representation of our communities, we began to collectively imagine a future Bay Area rooted in Indigenous governance, with housing and healing and health for all. A future where grizzly bears and salmon have returned to the forests and rivers; where all communities have access to locally grown healthy foods and farmworkers collectively steward all the farmland in relationship with Native peoples; where housing is free and cooperatively, tribally, or publicly owned; where public institutions practice healing ceremonies, and fossil fuels have become completely obsolete. Simply put, a future where people live in right relationship to each other and to the Earth. Community governance that follows indigenous leadership, builds regional alliances for movement power, and has the capacity to govern under rapidly changing conditions. We left this gathering with the precious seeds of a robust and revolutionary collective vision for the Bay Area. How we each nurture and tend those seeds remains to be seen, but there was a palpable desire from many participants to continue deepening the relationships that may get us there. We had no illusions about the futures imagined by status quo institutions and actors -- but we also left grounded in the knowledge that our vision seeds are rooted 5,000 years deep in the soil already, and roots that deep might just be resilient and resistant enough to create a new abundance for all. 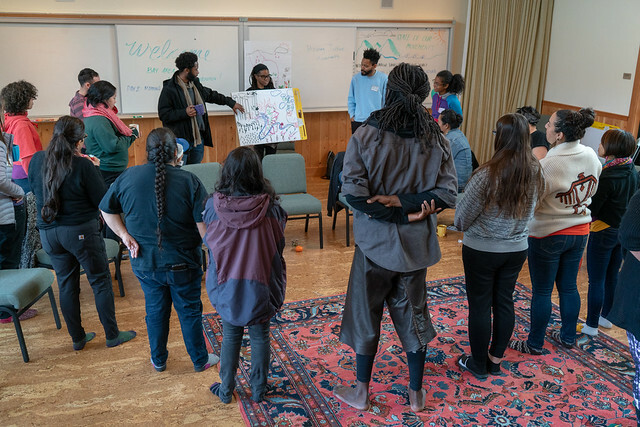 The Bay Area Land Justice Convening was co-organized by staff at Sogorea Te Land Trust, The Cultural Conservancy, People of Color Sustainable Housing Network, Movement Generation, and Sustainable Economies Law Center. Deep gratitude to everyone who participated and shared their visions, to our incredible facilitators kiran nigam and Christine Cordero, to Occidental Arts & Ecology Center for hosting, and the Federated Indians of Graton Rancheria for welcoming us to their territory.